Stocks finished the week with gains on Friday, and investors are cautiously optimistic that this year's rally still has legs. The Dow Jones industrial average, the S&P 500 and the Nasdaq all rose slightly. For the week, the Dow and the S&P 500 ended up a bit, while the Nasdaq posted a small loss. Stocks are coming off a strong month. 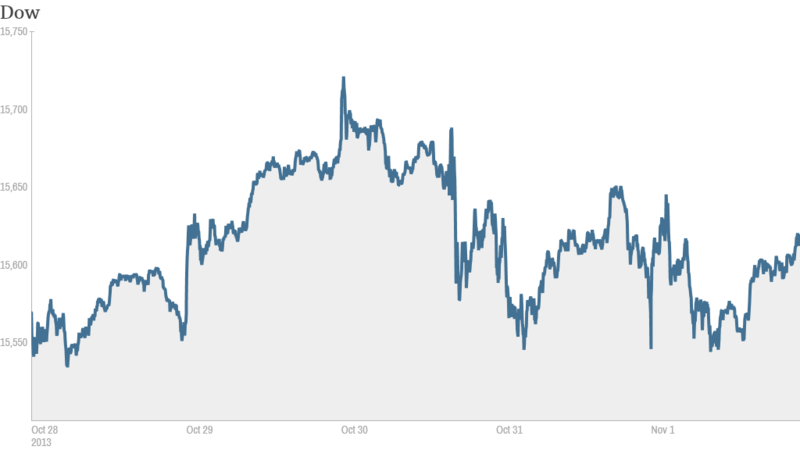 The S&P 500 gained 5% in October, a significant jump considering the government was shut down for more than two weeks. The Dow and S&P 500 are both hovering near record highs. If history is any guide, the good times should keep on rolling. The S&P 500 has gained in November more than 60% of the time over the past 30 years, according to Schaeffer's Investment Research. Ryan Detrick, senior technical analyst Schaeffer's, said November and December have been even stronger in years when stocks have rallied during the first quarter. The theory is that investors who missed the early gains try to make up for it in the final months of the year, he said. "We expect to see aggressive buyers into the end of year on any and all pullbacks," said Detrick. Even with the S&P 500 up 23% this year, investors continue to pile into stocks. Investors poured more than $10 billion into equity funds during the six day period ending Oct. 29, according to data from EPFR Global. The Fed's bond buying program has been a major catalyst of the bull market over the past few years. While the central bank is expected to stay on hold into next year, investors have been keeping close tabs on the latest economic data to gauge when the Fed might start to pull back on its stimulus efforts. There was only one major economic report released Friday. But the news was good. The manufacturing sector continued to expand in October. The ISM index rose to 56.4, up from 56.2 in September and topping forecasts. What's moving: Chevron (CVX) shares tumbled after the energy company's quarterly results missed expectations. AIG (AIG) shares sank after the company's sales growth disappointed investors. Ford (F) was lower after the company reported that auto sales in the U.S. rose 14% in October. General Motors (GM) shares rose 1% after the company said U.S. sales were up 16% last month. Toyota (TM) reported an increase in sales as well. Honda (HMC) said sales rose 7.1% last month. Shares of Madison Square Garden (MSG) fell even though the sports arena operator reported strong results. Sony (SNE) shares fell after the Japanese electronics maker posted a loss for the second quarter and said profits for the year would be 40% lower than forecast. Shares in the Royal Bank of Scotland (RBS) slid after the U.K. bank reported far worse than expected quarterly figures. Avon (AVP) shares rebounded from sharp losses Thursday. The U.S. cosmetics giant has been trying to stage a turnaround but posted much weaker-than-expected quarterly results on Thursday. But First Solar (FSLR) stock surged after the solar panel company reported quarterly earnings that easily beat expectations. Container Store cannot be contained. Shares of the home storage retailer doubled in their market debut. The Container Store (TCS) priced its initial public offering at $18 per share. The stock jumped 102% to above $36 a share. It was the latest in a string of hot IPOs. On Thursday, shares of 58.com (WUBA), the leading classifieds site for local merchants in China, shot up more than 40% on its first day as a public company. And all eyes will soon be on Twitter, which is expected to debut next week. The strong demand for The Container Store shares took some StockTwits traders by surprise. "Containers are much more popular than I thought...but is it necessary to dedicate an entire store? $TCS," asked one CapitalObserver. "$TCS at 35 is a freaking bubble," said momomiester. "That thing up here shows you we are out of control in some areas of the market and it can't last long." Still, The Container Store has its defenders, including one trader who was apparently still feeling the Halloween spirit. "Why shouldn't $TCS be almost 2x its issue price? Its an all-weather cyclical. Even surviving a zombie apocalypse requires storage solutions," said andrewunknown. European markets ended mixed. A tepid report on eurozone inflation gave rise to speculation about an interest rate cut by the European Central Bank. Asian markets also ended mixed. Chinese stocks got a boost as a new report showed Chinese factory activity picked up speed in October. Berkshire Hathaway (BRKA)shares were down slightly in after hours trading Friday after the company missed analyst expectations.